We have solar projects across the US. Learn more about Massachusetts solar below and watch for more states coming soon. The Bay State ranks among the top 10 solar states and offers a new SMART incentive program to double the state’s solar capacity. 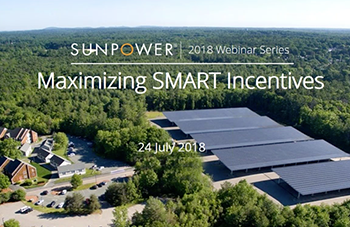 SunPower has a team of experts and local installers in Massachusetts to help your organization take advantage of these incentives before they run out. The school district offsets 75% of their energy needs from solar, but that solar energy is being generated 30 miles away by a rooftop installation on a commercial office building in West Bridgewater, Mass. This unique way of going solar takes advantage of unused space while saving the district $5.5M. The new SMART (Solar Massachusetts Renewable Target) program is aimed at adding 1,600 megawatts (MW) of solar power, and offers fixed incentives versus the fluctuations of solar renewable energy credits (SRECS). But act now because incentives will fall as more solar capacity is added. 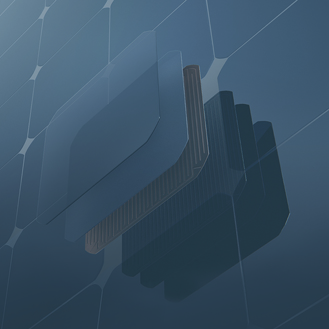 If you want to secure your organization’s solar installation in Block 1, the time to act is now. SunPower explains the 7 steps to help your organization reach major project milestones in sync with SMART program milestones. How much can your organization save with the Commonwealth’s SMART program? Stonehill College offsets an estimated 25% of electricity with solar. Macy’s has solar on 71 sites across eight states including Chestnut Hill in Massachusetts. Cronig’s market in Martha’s Vineyard expects to save $2 Million in 25 years. 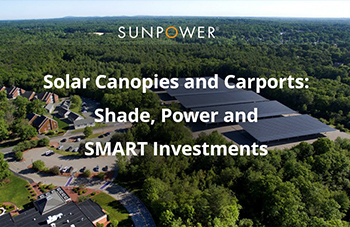 SunPower® carports make an elegant statement on sustainability while providing the luxury of shaded parking for employees and customers. Add optional electric vehicle charging and your employee or customer’s EVs will be charged up for the drive home. If you aren’t ready for solar carports, rooftop solar is a faster way to reap the benefits of solar with minimal business interruption. 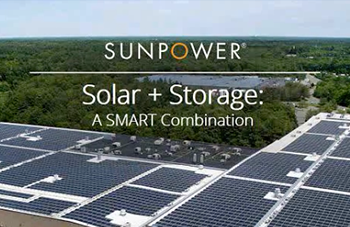 SunPower’s versatile system configurations meet a wide range of energy goals—from maximizing your IRR to maximizing the NPV of your investment. If your roof isn’t large enough or has too much shading, ground-mount solar could be an option if you have access to nearby unused land. These systems take more time install than rooftop solar, but are often larger with the ability offset more of your electricity costs. Store energy during off-peak hours and discharge the battery when demand spikes occur. This reduces electricity bill demand charges and increases savings that we back with our unique Demand Assurance Guarantee. In Massachusetts, SunPower offers a range of STEM-based education programs for schools to inspire our next generation of advanced energy leaders. Among our initiatives, our partnership with Project Lead the Way sparks students' curiosity about science, engineering and technology, while giving them tools they need for success in any academic pursuit. When will the SMART program begin? The program began accepting applications at noon on November 26, 2018. Projects interconnected after January 1, 2018 are eligible for SMART assuming they have not applied for SREC II. Given typical development timelines, most new solar projects will be eligible for SMART. How long will the SMART program last? SMART will be available for new solar projects until the program’s capacity of 1,600 MW is reached. What happens to existing Massachusetts state incentive programs? SMART replaces the Commonwealth’s previous SREC-based incentive programs. SREC programs have reached their original planned capacity, although SREC II was extended through the Spring of 2018. Relative to the SREC programs, SMART offers more predictable, consistent income. The SMART program is separate from net metering credits, and incentive income will be delivered separately from the system owner’s utility bill. You do not have to be the owner of the system to benefit from this program. Organizations that choose to finance their system with options like solar PPAs or leases can still benefit through expected rate reductions passed on from the actual system owner. When the program becomes operational, solar projects must submit an application to a state “Solar Program Administrator” who will approve participants and manage block reservations. The Administrator will also determine total incentive amounts and issue monthly payments. An energy consultant or solar provider can help guide you through this. In order to qualify for a SMART block, projects must submit an executed Interconnection Services Agreement, proof of site control, and all special project permits to the Solar Program Administrator.